You remember Chromebooks, don’t you? They’re the small, inexpensive notebooks that were supposed to seriously eat into Microsoft’s market share by showing the world that you don’t need a big operating system to get big work done — just a lightweight one to get you internet access. Devices you could buy for less than the price of a piece of software. Hardware that would finally prove to the world that there’s no need for Microsoft Office and other big, client-based software — a free copy of Google Docs would do. Things didn’t quite turn out that way. Windows laptops are thriving, and Chromebooks are rarely used in enterprises. Microsoft Office still rules the office suite world. Microsoft has no need to worry — right? Well, not quite. There are signs that Chromebooks are a bigger long-term threat to Microsoft than you might imagine. A shift from Windows laptops to Chromebooks won’t come overnight, or even in the next few years. But over the long term, they’ll likely be a serious competitor. The reason? Chromebooks sell big in education. They’ve unseated the Mac in schools. Two years ago, for the first time, Chromebooks outsold Macs in schools. Schools are a great market for Google, but Chromebooks are also Trojan horses. Children and teens use them for schoolwork and more. And when they get Chromebooks, they also get free subscriptions to Google’s G suite of apps. If kids grow up using G Suite and Chromebooks, there’s a reasonable chance they’ll use them when they get older. Where I live, in Cambridge, Mass., the public Cambridge Rindge and Latin High School gives out free Chromebooks to every one of the more than 2,000 teens in the school, in a bid to close the digital divide between families who can afford to buy computers for their children and those who can’t. 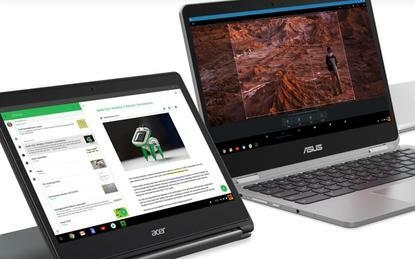 Gina Roughton, assistant director of educational technology for Cambridge Public Schools, says Chromebooks were chosen rather than PCs or Macs because “they’re an amazing device in terms of a tech perspective. They boot up in seven seconds, so there’s no loss of instructional time. "And the obvious is that they are on the Google environment and we’ve been a Google for Education school district for seven years now, so it’s our preferred use for online collaboration and productivity tools." Cambridge isn’t unique. According to a 2017 article in The New York Times, “More than half the nation’s primary- and secondary-school students — more than 30 million children — use Google education apps like Gmail and Docs. "And Chromebooks, Google-powered laptops that initially struggled to find a purpose, are now a powerhouse in America’s schools. Today they account for more than half the mobile devices shipped to schools." But wait, you might say. The Mac was popular in schools for years, and that didn’t help Apple make serious inroads into Microsoft’s stranglehold in businesses. That’s true. But this time things are different, for three reasons. One is price. Macs are more expensive than PCs, while Chromebooks are far less expensive. That makes it more likely that people will buy Chromebooks for their own computers, and that enterprises will follow suit. Second, enterprises now are much more likely to follow users’ lead on technology in this BYOD age. In addition, there’s G Suite. Apple never had an office suite that could compete with Microsoft Office. Once students get used to Google’s office suite, they’ll be more likely to use it after they graduate. When students graduate, Google makes it easy for them to move all their mail and documents from their school accounts to their personal accounts. And schools sometimes even act as inadvertent salespeople for Google. The Times reports that some schools tell graduating seniors to move all their documents from their school to their personal accounts. The upshot of all this? Windows hardware continues to rule in enterprises. But Chromebooks may one day prove a serious competitor, as students make their way into the workforce.